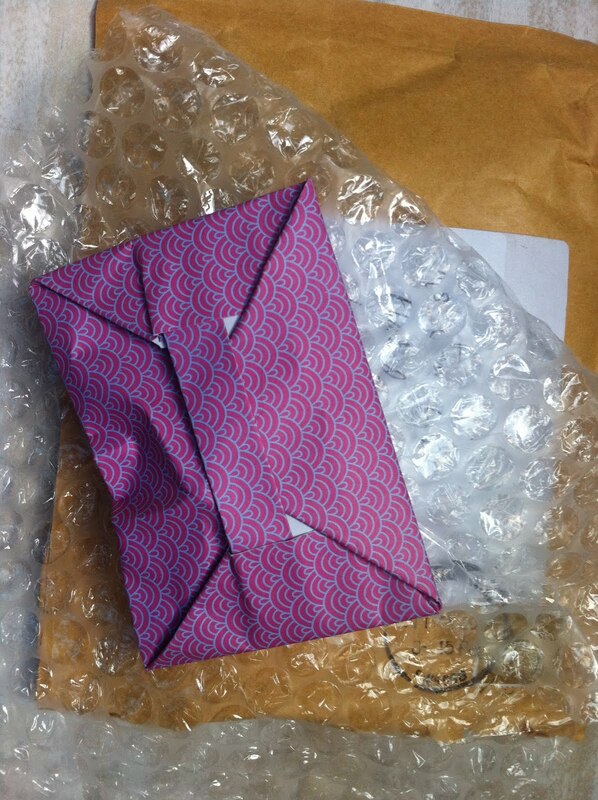 I seem to have been an extremely lucky girl recently - I've had some little parcels full of joy land on the doormat and I'm feeling pretty spoilt . . . . 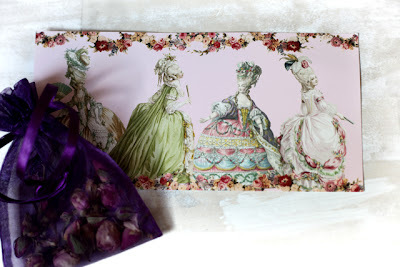 This gorgeous Marie Antoinette postcard and heavenly little organza bag of dried rosebuds for brewing a cup of rosebud tea were a lovely treat from Denise @ The Swelle Life, I'll try to remember to take a picture when I make some as it's bound to look as pretty as it will be delicious and the Marie postcard has set up camp looking lush on my noticeboard. Thanks Denise! Then this little package of prettily folded origami envelope prettiness turned up, it looked so nice I was loth to open it - but inside was . 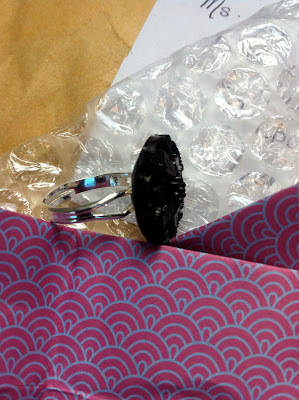 . .
A super cute ring made by the lovely Lakota of Faith, Hope and Charity Shopping, I'd have done a modelling pic but my hands are a tad dragon-scaly at the moment and I wouldn't want to scare you all! Thank you Lakota - it's going to look fabulous with a dress I've found for a wedding in August and at the moment it's looking amazing on my ring holder. Scarlett, of Scarlett Loves Elvis, seems to know my taste as well as I do - she clearly has some undisclosed mind-reading capabilities! 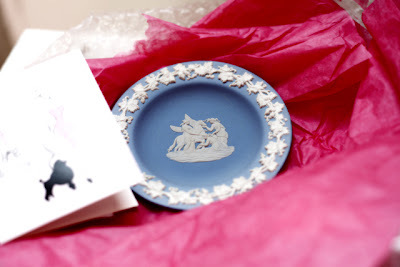 Wrapped in a cloud of super pretty pink tissue paper was this beautiful Wedgwood trinket dish, honestly it's something I would have snapped up myself if I'd come across it on my thrifty travels - the Pegasus designs are my favourite in the jasperware line. Thanks, Scarlett! Hope you're all having a great weekend so far - my parents are visiting at the moment so I've used the magic of the scheduled post! definite proof to the saying "good things come in small packages"
Lovely gifts. Lucky you. Enjoy the rest of your weekend. Oh what lovely treats, Jem! That tea with the rosebuds will be scrumptious!